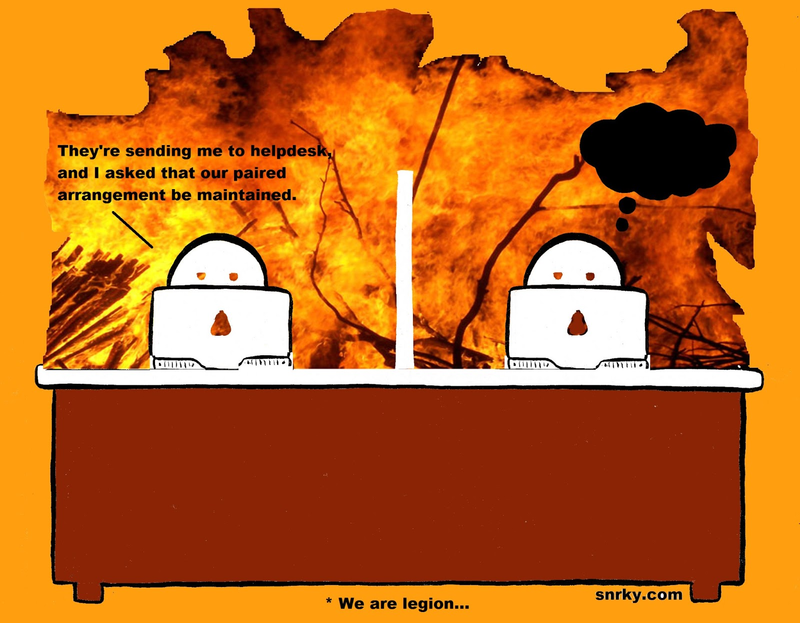 I hadn't heard helpdesk referred to as helldesk in a very long time. So it was amusing to see it in an article that struck close to home such as this The Daily WTF, Accounting for Development. Primarily because the gist of the post once happened to me as a contractor. I wasn't an accountant, but I was told the job I was interviewing for - and it was a two-way interview in my opinion, most contracting gigs were - would be bypassing IT. The team I was talking to needed a new application, but couldn't convince IT to implement it on their time schedule. They'd found some money in their budget, and wanted to use it "during the fiscal year" (which I interpreted to mean there might be money to start their project, but not necessarily to finish it) to show off what IT wasn't building and that they could build without them. I wouldn't be referred to as a developer, just a "consultant", and I couldn't use corporate (disk/software) images or database instances, or even corporate resources at all if possible, because then IT would find out and put a stop to it and "they have more corporate clout in our organization." I politely declined the gig, which really annoyed my contracting placement rep - although the fact that I'd been sent alone spoke a bit to faith in my ability to sell myself and make good decisions - until I pointed out we'd lose all other contracts with that rather large company had I said "yes". I've often wondered if they ever found someone willing to take on their IT-flanking object and how miserable that person must have been once the inevitable political fight erupted. Snarky: They're sending me to helpdesk, and I asked that our paired arrangement be maintained.